We have a little Christmas Gift to our Transformers fans. 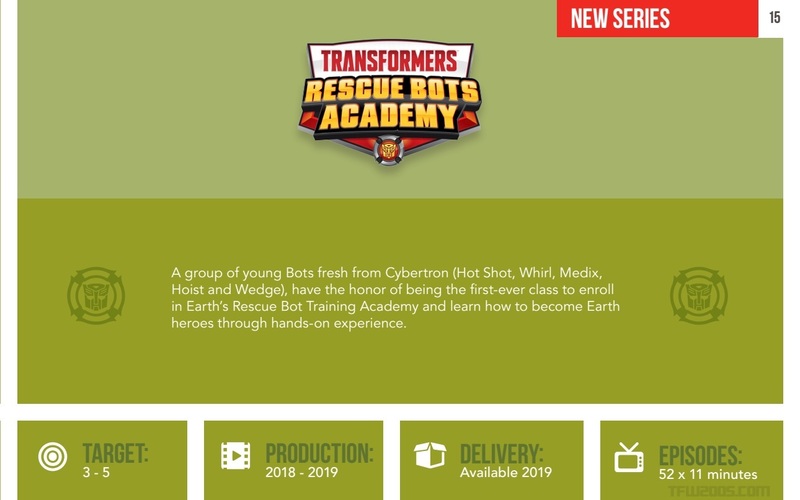 Coming straight from Hasbro Studios, we have our first look at the upcoming animated series Transformers: Rescue Bots Academy. The series is produced by Hasbro owned Boulder Media Limited in Ireland (formerly known as Boulder Media Studio), to be released in 2019. 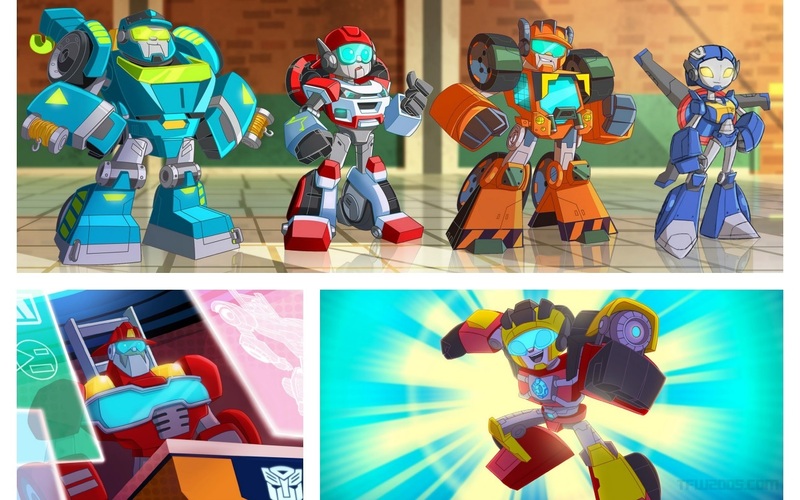 Rescue Bots Academy will act as a sequel series to internationally acclaimed Rescue Bots series. The first season of this new series will consist of 52 episodes with 11-minutes of running time each. RBA will feature an all new cast with cameo appearance by some familiar faces from the old show. You can check out the new images from the show, after the jump. We just heard yesterday that there's a new wave of Rescue Bots Rescan coming. My prediction: Rescue Bots will continue as a line, incorporating Rescue Bots Academy characters along the way. Should that happen, Rescue Bots will have passed Generation 1 to become the longest running Transformers toyline. It already surpassed the G1 cartoon in season count. I was asking more since I don't recall any publicity statements regarding a toy line. I would expect one but was wondering if i missed some mention in a press release. I thought the story was that they let the original voice cast go, but they're gonna have Heatwave in some capacity. Hope he's still voiced by Steve Blum. There's always a toyline, why wouldn't this one have one? My kids (9, 8, 6, 4) still love the original Rescue Bots. They will be too old for this one, except maybe my youngest, but I hope that this show catches on with a new wave of kids as it did with mine. Sorry to be the bearer of bad news but Steve Blum confirmed he wouldn’t be reprising his role as Heatwave. They really are replacing the entire cast. I like the designs and think it looks like a fun kids show. My question is (and this might be in another thread): Will there be a toy line to support this show? I just realized that Wedge is orange and looks like he might turn into a construction vehicle, just like Wedge in RID 2001. I want him to turn into a mechanical orange and run over his foes like a giant, sentient bowling ball. Proto-forms developing? Transformers Animated had already established an existence of a cybertronian elementary school (Arcee being a teacher). At this point, the Transformers fiction is so convoluted with such weird crap (mass-shifting, an existence of a Transformers god, terrible retro-canonization to fix plot holes, car-washes of death, scraplets, Rumble turning into a tree, annoying kids) I am surprised of all of this weird fictional crap, people are angry about cybertronian kids in a show aimed towards a younger demographic. Well you could be right but we still have yet to see them next to anyone or anything besides each other. So until then we still don't know their heights. Proto-forms developing? Transformers Animated had already established an existence of a cybertronian elementary school (Arcee being a teacher). At this point, the Transformers fiction is convoluted with weird crap (mass-shifting, an existence of a Transformers god, terrible retro-canonization to fix plot holes, car-washes of death, scraplets, Rumble turning into a tree, annoying kids) I am surprised of all of this weird fictional crap, people are angry about cybertronian kids in a show aimed towards a younger demographic. I can't argue with that logic. Ouch, shame on me. I just think its a tiresome cliche'. How do we know these Transformers are kids? We don\'t know how tall they are in this, the new Bots haven\'t been shown next to anyone of the old bots or the Humans. So that could be the same sized as Heatwave and the others. They could just look small to us at the moment. People are criticising Rescue Bots in general, but I find the show surprisingly well-written for a younger-aged Transformers kids' show. Also, do you guys remember the Rescue Bots' predecessor, the 2003 Transformers Go-Bots cartoon? Ew. Oh my God, little kid Transformers! They're so adorable! I love that Hot Shot has finally found his place to shine since Bee stole his spotlight. I don't mind the art style shift. Then again, Animated is still my favorite TF show, so radical stylization does not phase me. I hope that the original VAs return when the original Rescue Bots get cameos. I also hope that more Rescue Bots get the NuRID Blurr treatment and get deluxe sized toys for either Generations or the Cyberverse toyline. I mean, the kids who started with Rescue Bots are more than old enough to be in the regular toyline's age range, and it's not like there aren't Hot Shot molds lying around (fingers crossed for the never released Animated version of him). I wasn't expecting Whirl to be a fembot here but then again it's not like the character took the appearance of a female in some way or another. *coughIDWholorformcough. * I'm curious if she'll have some of the IDW Whirl insanity or at least more of a thrillseeker then she ought to be. Also it's great to see hot Shot show up again. He hasn't had a large role since Cybertron ended so this is a pleasant surprise. Is it bad if i feel more intrigued by this than cyberverse?